appx 7 mo, a little more LP at some point. a year later... a little over 19 months old worn almost every day. and to the question about the black from the buckles, I've tried everything to clean it, I think your best bet is to embrace it! one for for good measure. 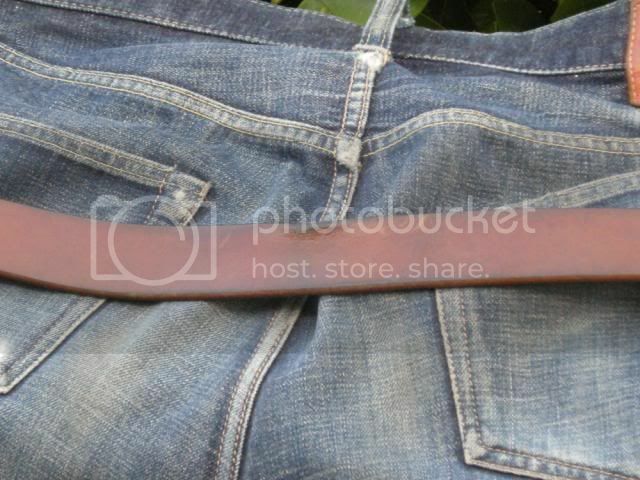 I like this one because it shows all the indigo that has faded off my jeans onto the belt. Unfortunately I know next to nothing about this belt. I inherited it from my buddy because it no longer fit him. He claims to have had it since he was a kid. That's where my knowledge ends. ...though I don't see how they're adjustable, and $155 seems pretty ludicrous to me. I'd love some more info if anybody has it. I just got back from a trip to Japan and bought a light natural colored Samurai Jeans curved belt from Americaya in Ueno. The guy said to tan it in the sun for 2 days before wearing it. Anyone ever done that? Have before and after photos? I wore the belt for a little bit (it's a beastly thing), but have since put it down since I want to tan it evenly. Damn! been waiting for this too. I thought I'd way in with a couple of my favorite belts.. the first a joint by Ralph Lauren is my very fav, I could not imagine a belt I'd like more than this one... wish it could last me forever. The second a double ring belt by Jcrew... both from many years ago. here's a belt I just made. My first ever leather project. i'm quite proud of it. 5mm thick leather. Simple yet effective. should easily outlive me!! I have a couple of belts from this guy, truly unique. Highly recommend. The 1cm thick Manufactum ox-leather belt has been posted a couple of times but most venerable members were too light-footed to try one. Well, I did. I can tell you that this thing positively puts all of the other belts in this thread to shame and that compared to those it could be sold for $400, if there was a price continuum. For the convenience of those who donâ€™t read German I will translate some of the stuff that the English website doesnâ€™t mention and stuff from the mfr website. The belt is almost 10mm thick. It is a single layer, not two glued together. It is natural leather but has a light wax coating. The edges are finished as per what you can read on the UK site. The belt buckle is solid brass, sand cast (artisanal technique) and silver-plated (silver the metal, not silver color). It is made in Italy and actually quite handsome. The line that you see along the edge is called â€œZierstrichâ€ which is best translated as decorative stripe. It is not a sewing line and doesnâ€™t come from a machine treatment or from the cutting process. The line is put there as a design feature. The holes are very precisely cut and oval in shape which allows the belt to lay flatter; kind of important with such a thick piece. The inside looks unfinished to me. It will take the indigo from your jeans. I wear it with a pair of Ironheart 634SR, the 23oz model. You can see more pictures of it on the Kreis website. Strangely, the close-up he has on his site is not representative of the beautiful and practically flawless grain of this belt leather made from the rear back (croupon) of an ox. I saw probably 12 of them at the Manufactum store in Berlin and they were all good. Even the color variation was minimal, given that this leather is tanned (or it wouldnâ€™t be leather) but not dyed. The leather comes from Great Britain, the belt is handmade in Germany and the buckle handmade in Italy. If you look at his site, you will see that even the quality of craftsmanship and finish is simply superior (sorry!) to that of the higher priced fashion-marketed Japanese products. Now you will want to know how does it wear. Well, in the beginning it was really super stiff but it loosened up quickly and according to mfr info will even stretch over time despite its girth. 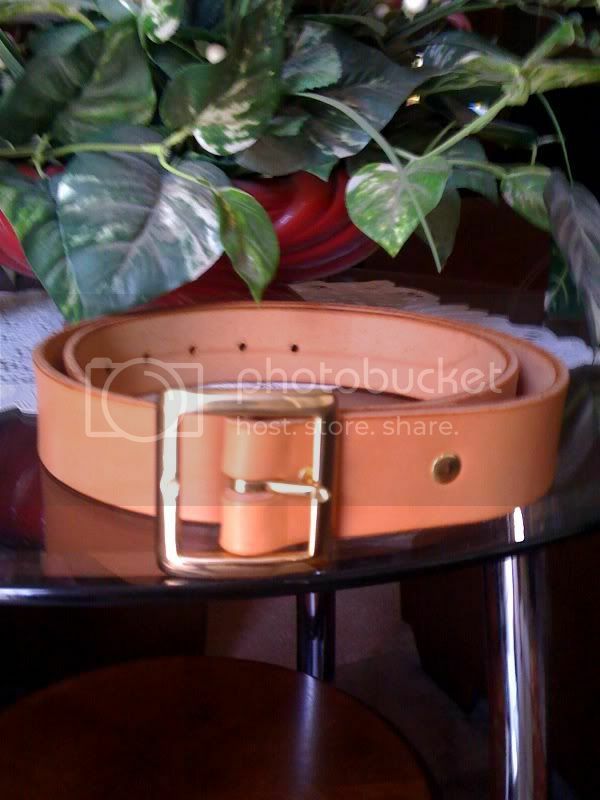 After two weeks of wearing it, buckling the belt is effortless and the leather is soft and flexible. Beware though, when you slap your hand with it, it will hurt because the leather is so heavy. The first few days the thickness and rigidity of the leather was a bit uncomfortable just like the 634SR arenâ€™t exactly comfy in the beginning but now I donâ€™t even notice it anymore. Why do I like it? Aparts from the objective reasons outlined above, I like exclusivity as much as the next guy on superfuture and this thing seems to be the thickest jeans style belt on the planet until somebody makes a whale leather model. Even elephant skin is not this thick. On top of it, it is at least as rare as the Japanese stuff and better made at a lower price. Whatâ€™s not to like? It even has a rather long tradition as Offenbach has historically been a center for leather in Germany and this business has been in the hands of one family of leather makers since 1963. Jeez, I sound like a TV spot. Anyway, nothing to do with either company, I just like their products. 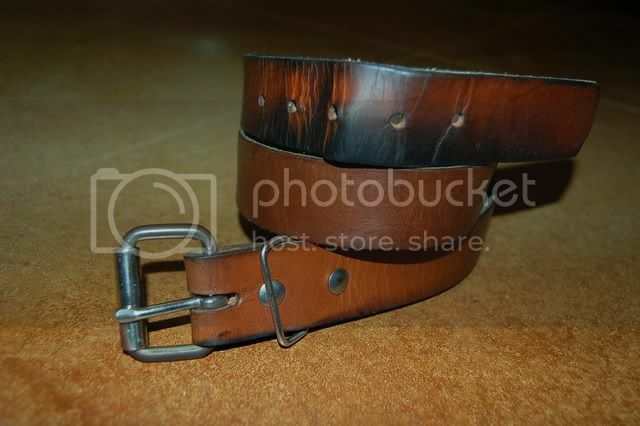 Informative post, great belt tfar! talents: some, but nothing of note. Is it difficult to sit as in do you feel it on your lumbar? 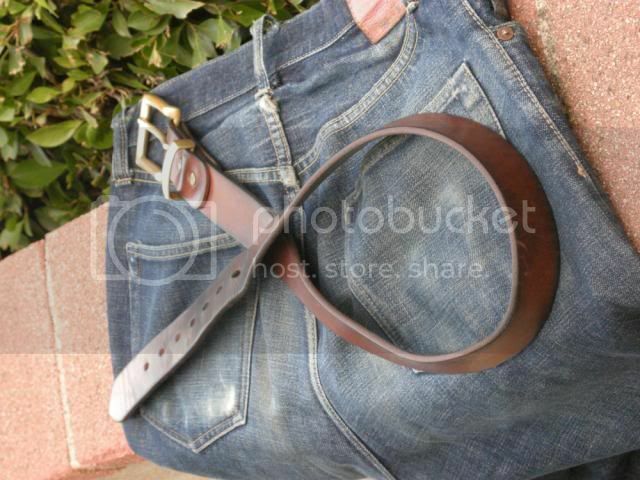 dopee belt! also I cant wait for LGC belt to cime next week! location: Chicago and Airport terminals. Very Nice Job!! Where did you get that belt keeper(metal loop?) 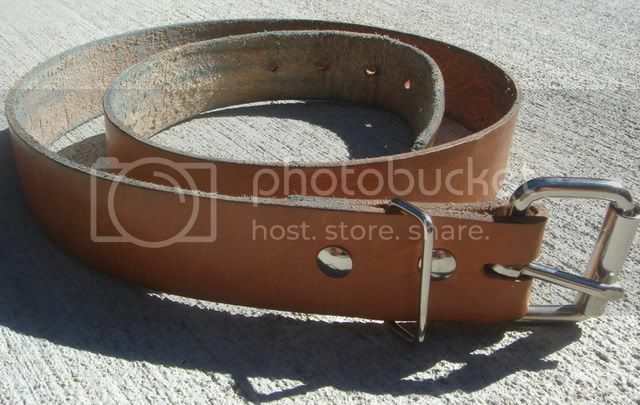 I could use some of those for my old belts! Thanks! I hope it helps those that are looking for a belt decide. Pricewise it is in its own niche. It will be more than the Corter, Tanner and unlucky belts which are frankly also very nice and it will be less (but better in my eyes) than the Japanese belts. Mine are 23 years old and still look great and I still wear them. The buckle is almost square at 56x57mm. Each metal "bar" is about 7mm thick. So this is not puny buckle by any means. It has a nice weight to it, too. I do not feel the belt at all in the lumbar region. When it was new I felt it a bit on my hip bones and in the love handles. Working on the lover handles. 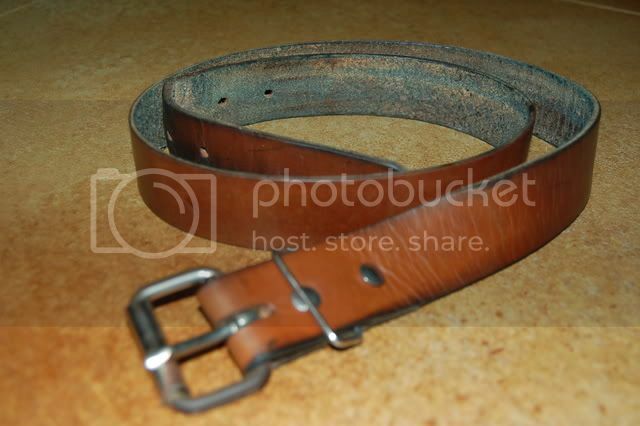 I could imagine however, that the belt might be able to provide lumbar support if needed if you cinched it up tightly. It is also a bit wider than the usual 1.5 inch belts. I just measured and it's exactly a 4cm strip. If you look at his site, you will see that even the quality of craftsmanship and finish is simply superior (sorry!) to that of the higher priced fashion-marketed Japanese products. I can't really agree with this statement, but the leather does look nice. The hardware looks flimsy compared to the belt. Have you seen Japanese leathercraft finishing techniques firsthand? It's definitely amongst the world's best. I have seen an FH belt on a friend. Very nice but still this is superior. Have you seen the Manufactum belt in person? And have you surfed the Kreis website a little bit to see his "fine" belts? 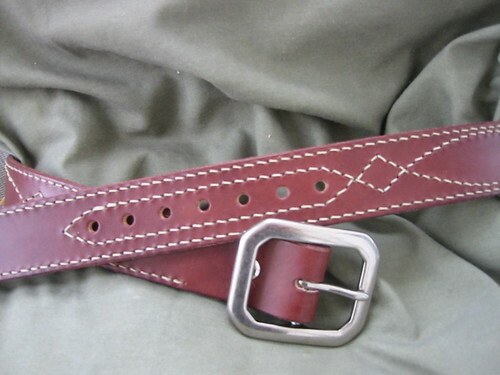 He also makes custom belts and cordovan (Horween) belts. Wonderful stuff. The finish on those is clearly better than on his own rough Manufactum belt and also clearly better than on the Japanese belts I've seen in person and in pictures. Otherwise, I don't dispute that the Japanese may have excellent craftsmen in just about any artisanal field including leather, of course. Just that this belt at $150 literally beats the pants off the competition. Even at the same price it would win unless you like a huge buckle. The picture is a bit deceiving. In reality the proportion looks just fine. Naturally, it also depends a bit on the size of the wearer. I am 180cm, 73kg and have a 33 waist. Looks alright on me. 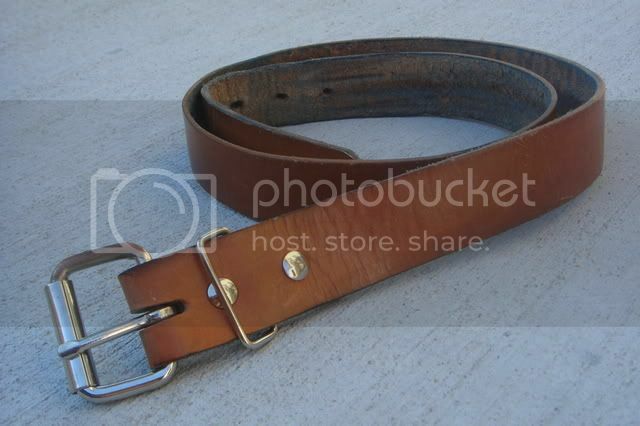 If the wearer is a 6'4" 250lbs guy, yes he'd be better served by a bigger buckle. However, there is one criticism that I have, too. The stitching on my particular belt where the buckle is held could be tighter. It is already double stitched with really thick yarn and perhaps they've done it on purpose to give the buckle enough room to move. But it looks a bit off when you look at it from above. I have not checked out the other belts whether they had that "problem", too. I also don't care for the Zierstrich (the decorative line that's imprinted all along the belt) so much but that's a matter of taste, I guess. I really do like the belt and buckle that Mr. Black posted a lot! So, I have just gotten into the whole denim scene recently and have been surfing around the board just trying to take in as much info as I can. As i stumbled across this thread i thought that since i just got myself a new belt i'd post some photos of it. I actually got this belt at a JC Penny's store and am really happy with it. I have just had some good luck and found belts I like on the cheap. This one was only thirty bucks, the brand is called American Life I believe, and I was really happy with it. So, here are the photos. Very nice! Beautiful color. Classic buckle. 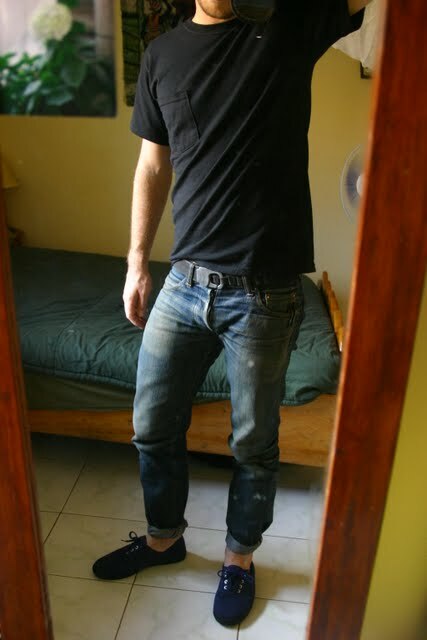 I also wear either a very light belt (see above) or something dark like this, depending on the shoes. If you guys really wanted a crazy thick belt that's super made... you should visit a real harness shop. MikeS, what's the thickness on that leather? Looks good. LGC belt just came in! I've had this pretty much since it became available at Self Edge...I guess about 1.5 years. 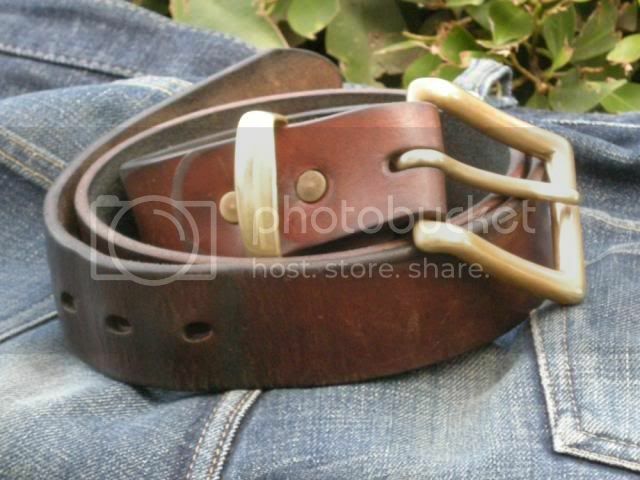 Iron Heart Natural belt with limited treatment with pecards and daily wear.